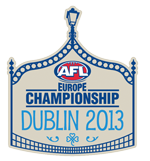 The AFL Europe Championships kick off in Dublin tomorrow, with Europe's six strongest footballing nations battling it out for the cup. Hosts Ireland will again go into the tournament as hot favourites, although with healthy competition from arch rivals Great Britain, Scandinavian powerhouses Denmark and Sweden, and the relative underdogs Croatia and Germany. The round one pool matches of Ireland vs Sweden and Great Britain vs Denmark will go a long way towards deciding who will meet in the final, with a large advantage to the winners in those matches. 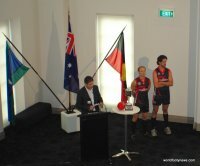 Fans will be able to check up on the full draw, squads and live results via the tournament website dublin2013.org, with scores also to appear here after each round, along with resultant changes in the WFN World Rankings. Peter Ross from the Irish Warriors has also published a form guide on his blog, which is available here.